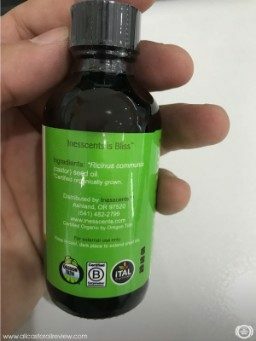 Organic Castor Oil 4 fl. oz. Hello everyone, Michelle here. I have another review for you guys. Today, I’m going to review Inesscents castor oil. 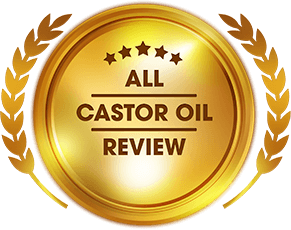 My research shows that this castor oil has many uses for personal care. It can be used on skin, hair, nails, lips, and eyebrows. It is used to make castor oil packs too. Read on to find out how I used this oil and the benefits I got. I received the product on time and it came in perfect condition. It was packaged in a box that is smaller than a shoe box. Inside, I found the bottle covered in bubble wrap. The oil came in a 2 fl oz. glass bottle, which is dark amber in color. I always prefer my castor oil in an amber glass bottle because the oil lasts longer. The plastic cap of the bottle is wrapped in tamper-proof seal. When I removed the cap, there is a white peel-off seal on the opening of the bottle. It prevents spillage especially when the product was being delivered. The label of the oil has complete information like its ingredients and suggested use. It has a USDA Certified Organic seal, Oregon Tilth seal, and iTAL Certified seal. These certifications show that the oil is pure, organic, and a non-GMO product. The label says that the product is pure and cold-pressed. This means that it doesn’t contain chemicals or solvents like hexane. The oil smoothed over my skin really well. It felt silky and moisturizing. I left it on for a minute or two and the oil already seeped through my skin. 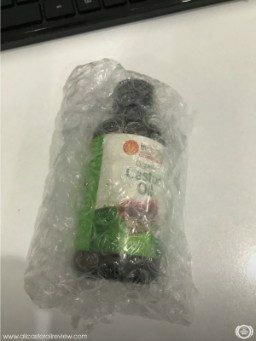 When I opened the product, I noticed that the oil doesn’t have a strong smell. I have to take a small amount of the oil to smell its earthy scent. It smells like raw crushed nuts and it is very subtle. I was surprised at how it smells so mild but I liked it. I used a clean new dropper to take a small amount and put it on the back of my hands. The oil was really thick and it has a pale yellow color. When I smoothed it over, I expected that it will feel heavy and sticky. But it didn’t feel like that. The oil smoothed over my skin really well. It felt silky and moisturizing. I left it on for a minute or two and the oil already seeped through my skin. I liked that the product didn’t smell at all too. Because the oil felt really good on my skin, I thought that it’s perfect for the lip scrub I wanted to make. The thickness of castor oil helps keep my lips plump even when after waking up in the morning. The oil has a lot of benefits. It is rich in essential fatty acids, especially omega 9 fatty acid. This means that the oil has great moisturizing powers. It can improve hair and skin health as well. 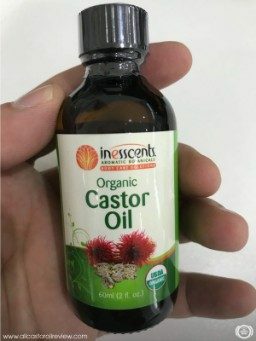 Inesccents Castor Oil has vitamin E too, which helps protect skin and hair from damage. This is what I liked about castor oil. It is so rich and nourishing that it can help improve not only my skin but my hair as well. The oil is organic so it’s safe to apply on skin, scalp, lips, eyebrows, and cuticles. Since I like to use liquid lipsticks, my lips often feel dry and cracked after I take off my makeup. I can’t go a day without using a lip balm because my lips feel really rough. I recently developed a habit of putting oils on my lips every night. Guess what I use on my lips? That’s right, it’s castor oil. The thickness of castor oil helps keep my lips plump even when after waking up in the morning. Mix the sugar and oil in a clean glass bowl. Transfer to a glass jar or tub and store in an area away from the sunlight. This scrub has a shelf life of 2-4 weeks. Apply the scrub on lips and exfoliate gently. Leave it on your lips for 1-2 minutes and wash off using warm water. Use a few drops of castor oil after to apply on your lips. Do this once or twice a week to protect your lips from dryness and cracking. I actually did this every two to three days for almost three weeks. The first time I used it, the result was really surprising. Because I use castor oil on my lips prior to this, I know that my lips felt really soft. However, when I used the scrub, it felt smoother and plumper. I noticed that it looked more pinkish every morning too. 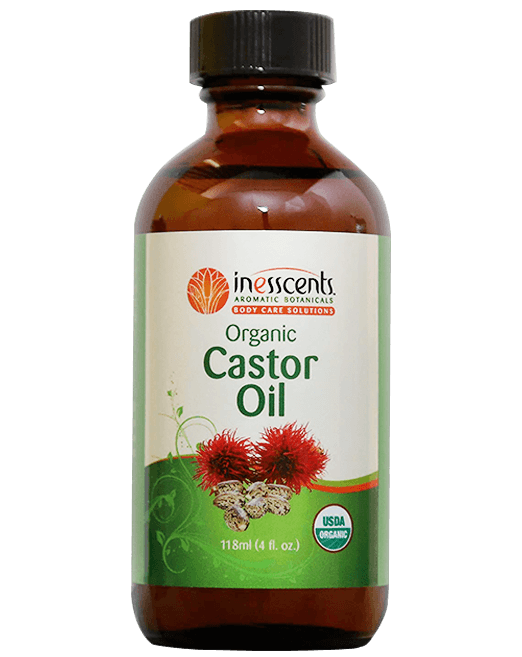 Inesscents Castor Oil is very versatile and has many healing properties too. Its therapeutic effects are suitable for a castor oil pack. My sister, the one that also loves castor oil so much, suffers from bad dysmenorrhea. It’s so bad that she has to take pain relievers every time. Castor oil packs are effective when it comes to easing pain caused by menstruation. I asked her to try it once. I sent her these steps on how to make and use castor oil pack. Fold a strip of cotton flannel to make three layers large enough to cover your abdomen area. Put the cotton flannel on a bowl and soak it thoroughly in castor oil. Let it saturate before adding more if it seems a bit dry. Leave it on the bowl for one hour or you can also let it saturate for 1 day. Place the soaked pad on your abdomen and wrap the larger cotton flannel around your waist. You can cover it with a plastic wrap to prevent the oil from making a mess. Use a heating pack or pad and place directly on top of your abdomen. Leave it on for 30-60 minutes until it takes effect. Rinse the oil away from skin using soap. You can reuse the soaked pad for another 2-3 time as long as you store it securely in a glass container. Avoid using it more than that because it can be unsanitary. My sister said that it took a really long time until she felt the effect. It didn’t make the pain go away but it eased a little bit, just enough so she can move around without doubling over in pain. She actually used the pack two more times and made another one. What I liked about this oil is that it is very thick and viscous but it doesn’t feel like that anymore after I applied it to my lips. What I liked about this oil is that it is very thick and viscous but it doesn’t feel like that anymore after I applied it to my lips. Since it doesn’t smell as strong as other oils, my sister told me that she mixed a few drops of lavender oil in the castor oil pack. The soothing scent plus the oil’s therapeutic effects were really great. I also appreciate this since I apply the oil on my lips and it doesn’t smell bad at all. The effects of the oil were really great too. I can tell my sister was hooked with the castor oil pack. Plus, I use less lip balms now. My lips stay moisturized all day long so I don’t have to worry about dry lips even when I use liquid lipsticks. I have a small amount left on the bottle so I’ll try using it on my eyelashes. I’ll update this blog once I tried it. Inesscents Aromatic Botanicals is based in Southern Oregon. It is a small family business that was established to create organic and natural body care products. The company created their collection to help provide products that can replace commercial goods. They make sure that each product is made of high-quality ingredients packed with nutrients that can help improve skin and hair. Inesccents is passionate about protecting the environment as well. Their products are all cruelty-free. They offer a free gift for orders above $25. Their customer support team is available 24/7 and can be contacted at any time. 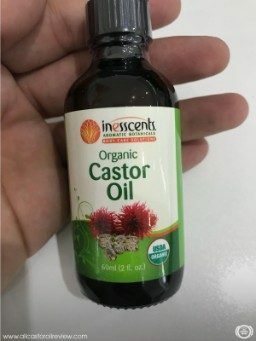 Try Inesscents Castor Oil to find out just how good this product is. Came in an amber glass bottle with tamper-proof seal. Oil is very thick and viscous. Has pale yellow color and mild nutty scent. Made my lips smoother. Worked for my sister’s dysmennorhea too. Free mystery product for orders above $25. 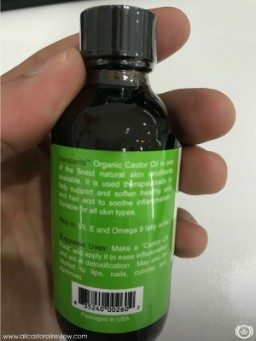 Organic Castor Oil 2 fl. oz.